Dr Nigel Willby, from the School of Natural Sciences, is leading the multi-partner £2.9m research project. 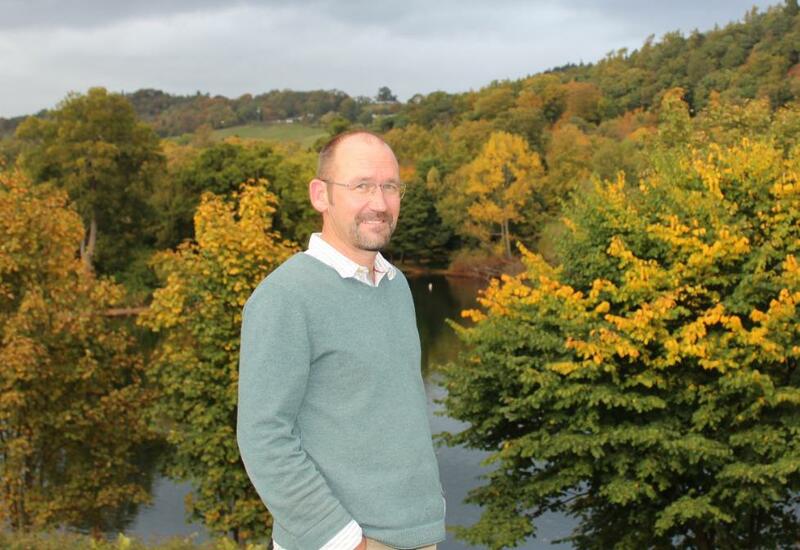 Major £2.9m funding for a University of Stirling-led study into the impact of people and the natural environment on freshwater biodiversity and ecosystem resilience, is announced today by the Natural Environment Research Council (NERC). Dr Nigel Willby, Stirling Reader in Freshwater Ecology, heads up the four-year multi-partner study which starts in December. Fieldwork will contrast three natural lake districts – Cumbria, the Norfolk Broads and Greater Glasgow – whose respective upland, agricultural and urban landscapes present different types of pressures. Working with Stirling are the Centre for Ecology & Hydrology; University College London; Lancaster University; University of Glasgow; British Trust for Ornithology and the Natural History Museum. Dr Nigel Willby, from the School of Natural Sciences, said: "This NERC-supported project cements existing collaborations, as well as building new ones, and confirms Stirling’s reputation as a centre for aquatic science research. "Above all, it allows us to do exciting and novel cross-cutting science on a large scale, and in a way that is directly relevant to the considerable, pressing challenge of managing our freshwater resources and protecting their biodiversity in an era of environmental change. "Aquatic systems like ponds, lakes, rivers, streams and wetlands have connectivity by water at their core. Understanding how this connectivity interacts with pressures - like disease, invasive species and heavy metal pollution - is of heightened importance as any negative effects may be felt over multiple scales. "From local water managers to UK-wide environmental and conservation agencies, our research will help to boost the effectiveness of their actions. It will also better inform policymakers, both at UK-level and those implementing the 2020 EU Biodiversity Strategy." The project 'Hydroscape: connectivity x stressor interactions in freshwater habitats' is among eight inaugural schemes to be backed by NERC's new competitive 'Highlight topics' strategic research funding stream. Dr Ruth Kelman, NERC's Head of Freshwater Sciences, said: "Rivers, streams and other freshwater environments are losing biodiversity and ecosystem function very quickly due to pressures such as climate change, pollutants and invasive species. "The new project, led by Dr Willby, will improve our understanding of the impact of these multiple pressures on freshwater ecosystems, helping us manage them more sustainably." Stirling colleagues Dr David Oliver, Dr Richard Quilliam and Dr Colin Bull, all from the University's Biological and Environmental Sciences Division, join Dr Willby on the project. Professor Gerry McCormac, University of Stirling Principal and Vice-Chancellor, said: "Dr Nigel Willby is to be congratulated on this impressive £2.9m award, announced today by the Natural Environment Research Council. "Our planet's freshwaters are a precious resource, and this landmark collaborative study, led by the University of Stirling, will enable a more integrated understanding of aquatic environments, in turn providing for their more sustainable management. "This multi-million pound project is further testament to the strength of Stirling's impact-delivering research, which saw us ranked by the Research Excellence Framework 2014 as being within the UK's top 40 Universities for research intensity." NERC is the UK's main agency for funding and managing research, training and knowledge exchange in the environmental sciences. Our work covers the full range of atmospheric, earth, biological, terrestrial and aquatic science, from the deep oceans to the upper atmosphere and from the poles to the equator. We co-ordinate some of the world's most exciting research projects, tackling major issues such as climate change, environmental influences on human health, the genetic make-up of life on Earth, and much more. NERC is a non-departmental public body. We receive around £370m of annual funding from the Department for Business, Innovation & Skills (BIS).